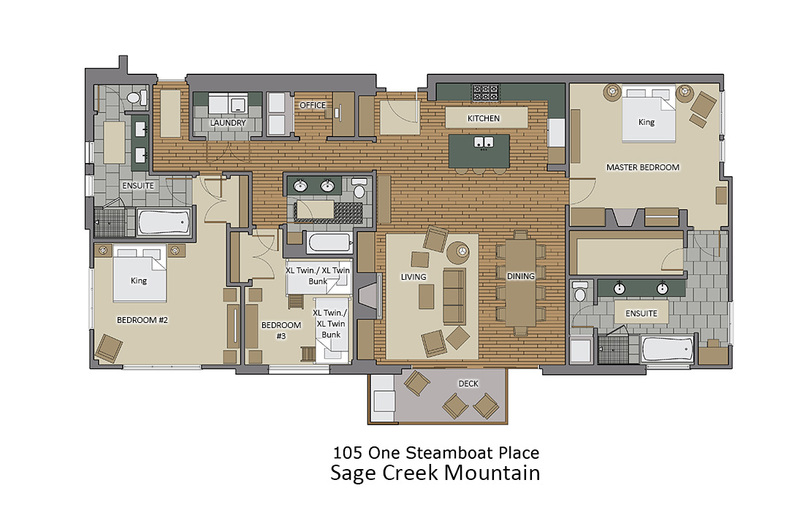 The Sage Creek Residence at One Steamboat Place is a delightful 3-bedroom residence that enjoys slopeside views and great access. Located on the ground floor you are conveniently located to the Mountain Village with no stairs or elevators. You are also just down the hall from the game room and Little Tyke's room, which will keep any kids in your group happy, no matter how old. With an inviting open-plan layout, you will find living and entertaining to be enjoyable and relaxing in this beautiful residence. The centerpiece of the living room is the majestic gas fireplace where your family or group can gather to re-live the days adventures, or take in a movie on the large flat screen TV. The iconic gourmet One Steamboat Place kitchen is equipped with Viking appliances and everything the most discerning chef can ask for, including a built in Viking Grill on the patio. There is a breakfast bar with seating for 3 just off the main island. When it is time to move the entertainment to the dinner table, you will find seating for 10 around a large beautifully crafted table. All One Steamboat Place residences feature rich colors, natural textures, and sumptuous fabrics throughout. The master bedroom offers a gas fireplace and large LCD TV. The main master bath features a steam shower and Jacuzzi tub. In this residence the second bedroom also offers a King bed with private bath. The third bedroom offers two sets of twin bunk beds, with a private bathroom right next door. My family had a great time. The place was exceptional. Service was great. I would definitely book the property again.